How To Apply for APTET 2019, Apply Online, AP TET Online application form @ https://aptet.apcfss.in/. 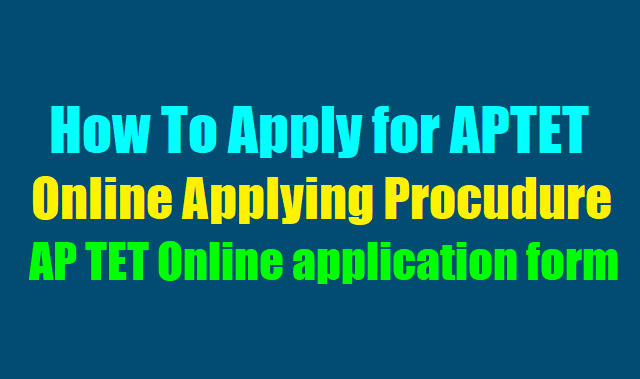 How to apply for aptet 2019, APTET Online applying procedure, ap tet 2019 user guide, apply online at https://aptet.apcfss.in/, AP TET Online application form. The Andhra Pradesh Teacher Eligibility Test (APTET 2019) is being conducted by Department of School Education, Government of Andhra Pradesh in all 13 Districts of the State through a Computer Based Test. The objective is to ensure National Standards and benchmark of Teacher quality in the recruitment process in accordance with the National Council for Teacher Education (NCTE). 2. Online applications are invited for the Andhra Pradesh Teacher Eligibility Test (APTET 2019) from candidates for all those aspiring to be Teachers in State Government, Mandal Parishad, ZillaParishad, Municipality, Private Aided Schools and Private un-aided schools in Andhra Pradesh State for classes I to VIII. i. The candidates shall first download the ‘Information Bulletin’ free of cost from the APTET website https://aptet.apcfss.in/, go through it carefully and satisfy their eligibility for appearing for APTET 2019.
ii. The candidate after satisfying himself/herself about the eligibility criteria for APTET shall pay a fee of Rs.500.00 through Payment Gateway between ...01.2019 for submission of application Online. On receipt of fee at APONLINE e-Seva the candidate shall be issued a ‘Journal Number’ with which he/ she can proceed with submission of application online. Issue of Journal Number does not mean that the candidate has completed submission of application online. It is only a confirmation of the fee received. a) Paste the photograph on a white paper and sign below (sign in Black Ink only). Look for the sample at point 16(iii), of the Information Bulletin on Page No.11. Ensure that the signature is within the box. Scan the required size containing the photograph and signature. Please do not scan the complete page. The entire image consisting of photo along with signature is required to be scanned and stored in *.jpeg format on local machine. Ensure that the size of the scanned image is not more than 50kb. If the size of the image is more than 50 kb, then adjust the settings of the scanner such as dpi resolutions, number of colours during the process of scanning. b) Applications with no photo / unclear photo / inadequate size photograph will be rejected. Hall – Ticket will not be issued to such candidates. Hence, after pressing the ‘UPLOAD’ button check if the photo is of required size, clear and is of the same candidate of whom the details are to be filled in the application. If the photo is smaller in size, not clear or does not belong to the candidate press ‘BACK’ button below the photograph on the application form and restart with scanning of the photograph. i. The candidates shall at first download the ‘Information Bulletin’ (free of cost) from the APTET website https://aptet.apcfss.in/, go through it carefully and satisfy their eligibility for appearing for APTET 2019.
ii. The candidate after satisfying herself/himself about the eligibility criteria for APTET shall pay a fee of Rs.500.00 per each paper as mentioned above through payment Gateway for submission of application Online. On receipt of fee at APONLINE e-Seva the candidate shall be issued a ‘Journal Number’ with which she/he can proceed with submission of application online. Issue of Journal Number does not mean that the candidate has completed submission of application online. It is only a confirmation of the fee received. a) Applications with no photo/ unclear photo/ inadequate size photograph will be rejected. Hall-Ticket will not be issued to such candidates. Hence, after pressing the 'UPLOAD' button check if the photo is of required size, clear and is of the same candidate of whom the details are to be filled in the application. If the photo is smaller in size, not clear or does not belong to the candidate press 'BACK' button below the photograph on the application form and restart with scanning of the photograph. b) Complaints relating to mismatch of photograph and candidate details will not be accepted after submission of application at any cost. v. Initial steps to be followed before filling Online Application Form. Andhra Pradesh Teacher Eligibility Test, APTET 2019 registrations and online applications process has been started.... The online application forms would be made available on the official website aptet.apsfss.in. The links are also available on the official website of Commissionerate of School Education, https://aptet.apcfss.in/. The official notification is available on the official website for candidate to go through. Steps on how to apply for APTET 2019 are provided below. Candidates are advised to go through the information bulletin carefully before filling the online application form. Also, please note that as per the information bulletin, the online applications would close on May 24, 2019. However, the last date to pay the fee and fill the online application form is set at May 23, 2019. Candidates interested are hence advised to fill the online application forms at the earliest. Also, candidates are first required to pay the fee and then fill the online application forms. b) Click on Application Form. e) Enter your Journal Number issued by Payment Gateway, the date of payment of fees and Date of birth. f) At the field ‘Attach your latest photograph' Click on Browse button and attach your photograph and your signature stored on the local machine. g) Tick the declaration and enter the verification code. j) When the application form is opened check if the photo is of required size, clear and is of the same candidate of whom the details are to be filled in the application. If the photo is smaller in size, not clear or does not belong to the candidate press 'BACK' button below the photograph on the application form and restart with scanning of the photograph. k) Confirm that the photograph is yours and that it is as per the given specifications. l) Fill in the application form as per the instructions given in the User Guide and Information Bulletin and those offered while filling the Online Application Form. n) If you find all the details correct press SUBMIT otherwise press EDIT and resubmit the information. o) On submission of application form online the candidate shall be given reference ID number which should be kept carefully for any kind of future correspondence. Submission of application can be considered to have been completed only on receiving reference ID number. vi. On submission of application form online the candidate shall be given reference ID number which should be kept carefully for any kind of future correspondence. Submission of application can be considered to have been completed only on receiving reference ID number. vii. On completion of submission, the candidates shall take a printout of the application and store it for future use. Candidates should not post the printout of the application to APTET office. ix. For domain related clarifications contact APTET office at Commissioner of School Education, Anjaneya Towers, B-Block, Ibrahimpatnam, Vijayawada. x. In any case applications will not be received in any kind of manual form. xi. Candidates can download their Hall Tickets from the website at http://cse.ap.gov.in from 09.01.2019. In case any candidate could not download the Hall ticket she/he should contact the Joint Director, TET, O/o the Commissioner of School Education, Anjaneya Towers, Ibrahimpatnam from 10.00 AM to 5.30 PM on all working hours between 18.12.2019 to 26.01.2019 in person only giving details of the journal number of the fee paid, reference number of the application submitted, a copy of the printout of the application form and one photograph (as pasted on the application form). xii. Request for issue of duplicate Hall Ticket will not be entertained after the examination in any case. Step wise detailed instructions for filling online application are given in the ‘USER GUIDE’ available on the website http://cse.ap.gov.in. • Request for change / correction can be made online at the complaint box on the website http://cse.ap.gov.in. Candidates will be given opportunity to submit their complaints regarding online application only twice. • Fee once remitted shall not be refunded under any circumstances. • It is to be noted that if a candidate has been allowed to appear in the Andhra Pradesh Teacher Eligibility Test it does not imply that the candidates' eligibility has been verified. However qualifying the APTET would not confer a right on any person for recruitment / employment as it is only one of the eligibility criteria for appointment. The eligibility shall be finally verified by the concerned recruiting agency/ appointing authority. • Furnishing of false, wrong or inaccurate information may lead to cancellation of the test result and even prosecution in appropriate cases. • No request for re-checking, re-assessment, re-evaluation or scrutiny of answer-sheets will be entertained. Please note, the link for fee payment is already active and the link to submit online applications would be activated at 3:30 pm today. Paying the fee does not qualify a candidate to appear for the examination. Candidates should remember to pay the fee and fill the online application forms. The online application forms for APTET 2019 would be available until January 17.., 2019.